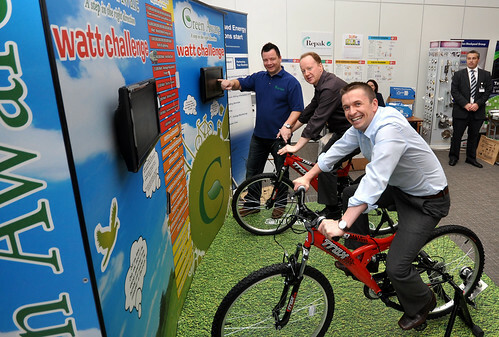 We recently helped our new friends on the Emerald Isle, Green Aware setup their own energy roadshow and energy awareness days as a service for their core business. They are using our youWatt Power Monitor and Bicycle Generator to measure POWER generated by the pedallers, which could be as much as 100Watts, and using this information to explain just how much household appliances require to operate. So even if I was generating 100Watts, I'd have to work 25 times harder to boil a kettle!